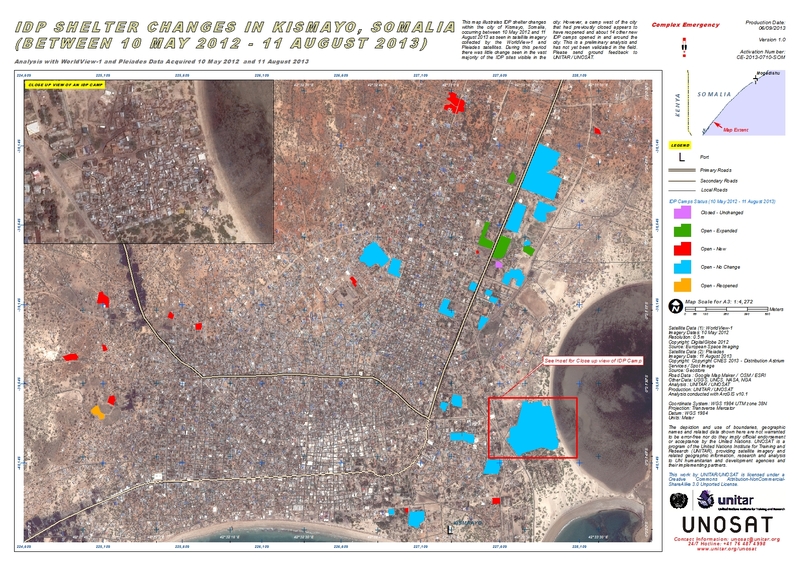 This map illustrates IDP shelter changes within the city of Kismayo, Somalia, occurring between 10 May 2012 and 11 August 2013 as seen in satellite imagery collected by the WorldView-1 and Pleiades satellites. During this period there was little change seen in the vast majority of the IDP sites visible in the city. However, a camp west of the city that had previously closed appears to have reopened and about 14 other new IDP camps opened in and around the city. This is a preliminary analysis and has not yet been validated in the field. Please send ground feedback to UNITAR / UNOSAT.